Many citizens, businesses and organizations in our community are reducing energy use and climate pollution. To lead, however, Charlottesville has to do more. As shown by the map below, communities throughout the Southeast are setting aggressive goals and taking strong action. So must we. By harnessing the power of community, together we can achieve local climate action and reach energy solutions that make Charlottesville an even better place to raise our families, grow our businesses, and strengthen our city. 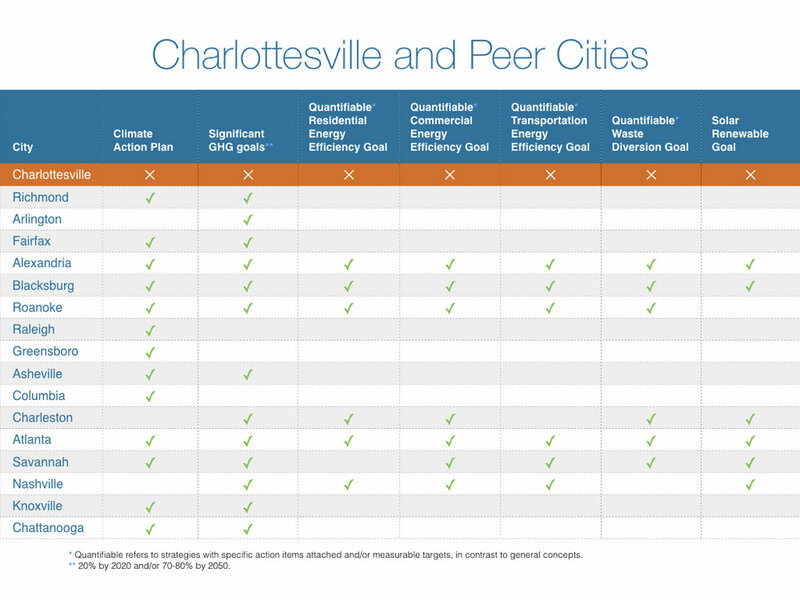 Cities like Blacksburg, Roanoke, Arlington, and Richmond are outpacing Charlottesville when it comes to making strong commitments to some of the bold actions necessary to lead (see the chart of commitments declared by peer cities below). Thankfully, that is starting to change as evidenced by the City of Charlottesville's signing of the Compact of Mayors and Albemarle County's renewed interest in climate action (access the City's Climate Protection initiatives here). C3 supports every step in the right direction. The reality, however, is that it is not solely up to government! Real progress will occur when all sectors – families, businesses, schools, community groups, and government entities – commit to bold action. Charlottesville continues to top the list of great places to live, work, learn and play. We’re proud of our community and passionate about the future we’re creating for our children here. We are also a community of leaders. We see problems and innovate solutions - together. It is time to bring our culture of leadership, innovation and collaboration to the issue of climate action. C3 was created to address what most consider the most pressing issue of our time: climate change. We are not here to reinvent the wheel. Rather we aim to unify and empower the actions of Charlottesville area families, community groups, schools, and businesses. See our vision for defining community climate success. Bold action, taken together, is the path forward. We know that together we have the potential to do so much more. Join us in taking climate action up a notch! Sources for map and chart resources include diverse telephonic, literature, and web research by the Adiuvans Foundation.